Ingolstadt/Geneva, March 4, 2014 – A completely revised edition of a modern classic takes centre stage with the world premiere of the Audi TT and Audi TTS at the 2014 Geneva Motor Show. The third generation of the compact sports car is again captivating, with its emotional design and dynamic qualities. The new Coupé is characterized by the use of innovative technologies in its engine and in its control and display concept, including the Audi virtual cockpit. When the first-generation Audi TT came on the market in 1998 it became a design icon with huge charisma. For the third TT generation, the Audi designers have returned to many of these ideas and placed them in a new context that is as dynamic as it is diverse. The flat headlights give the new TT’s face a determined, aggressive look. Specifically at the tail, horizontal lines give the impression of the new TT’s sporty stance. 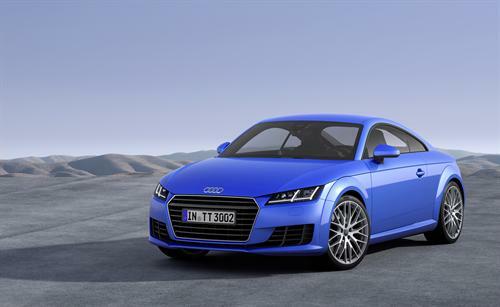 Audi offers the new TT and TTS with three different four-cylinder engines with turbocharging and direct injection. Their power output ranges from 184 bhp to 310 bhp. The two TFSI petrol engines and the TDI combine athletic power with trailblazing efficiency. 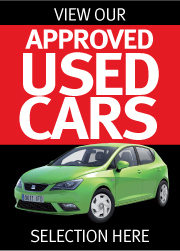 The start-stop system is a standard feature. For the launch of the TT, the 2.0 TDI will be available with manual shift and front-wheel drive. It delivers 184 bhp and torque of 380 Nm. The new sports car can thus accelerate from 0 to 100 km/h in 7.2 seconds and reaches a top speed of 235 km/h. Standard fuel consumption is a mere 4.2 liters per 100 km which translates into CO2 emissions of 110 g/km a new record low level in the sports car world. The intelligence of quattro drive – in other words, the software that determines precisely the possible torque distribution between the front and rear axles – is a completely new development especially for the TT. The innovative control philosophy continuously senses the ambient conditions, driving status and the driver’s wishes. The chassis also reflects the technological expertise behind the new Audi TT. The front suspension is based on a McPherson system; aluminium components reduce the weight of the un-sprung chassis masses. In this way, the new Audi TT’s superb driving dynamics are further optimized, and body control also ensures good comfort behaviour. The system is unique in this market segment. Another highlight is the standard progressive steering – its rack is designed such that the ratio becomes more direct as the steering is turned. In this way, the new TT can be steered agilely and precisely with little movement of the steering wheel in downtown traffic and on winding country roads. The electronic stabilization control (ESC), which can be switched off either partly or completely, perfectly complements the car’s sporty handling. Sport mode supports particularly sporty driving, facilitating steering and control when drifting. Lightweight construction is one of Audi’s greatest areas of expertise. The second-generation Audi TT already featured an Audi Space Frame (ASF) body made from aluminium and steel. For the new TT, Audi has systematically taken this composite construction principle even further, in line with the idea: the right amount of the right material in the right place for optimal functions. Audi engineers have, for the second time in a row, succeeded in significantly reducing the un-laden weight of the Audi TT. At the first model change in 2006, up to 90 kg were saved, and the 2.0 TFSI engine variant of the new TT weighs just 1,230 kg. This makes it around 50 kg lighter than its predecessor. The rule was once again: “less is more.” Clear, purist lines underscore both the lightness and the uncompromising sportiness of the Audi TT’s interior. Two other ingenious design and technically innovative tricks enabled the designers to create an instrument panel that is impressively slender: The instrument cluster and the MMI screen have been combined to form a central, digital unit – the so-called Audi virtual cockpit. In the pursuit of lightness, the standard sports seats in the new Audi TT they are more than five kilograms lighter. Instead of the conventional analog displays, the new Audi virtual cockpit is a fully digital instrument cluster sets new standards with its dynamic animations and precise graphics. Drivers can choose between two display modes: In the classic view, the speedometer and rev counter are in the foreground; in “infotainment” mode the virtual instruments are smaller. At the lower edge of the 12.3” TFT Audi virtual cockpit, the displays for outside temperature, time and mileage are permanently visible. Warning or information symbols may also appear there. The new Audi TT offers a far more distinct and colourful range of colours than its predecessor. There are 11 exterior colours, one of which is exclusively for the S line. Seven of the colours in the range are new for the TT, and two of these are completely new for Audi: Nano Gray and Tango Red. There is a completely new range of colours for the interior, too – the Audi TT and the TTS each offer three interior colours to choose from. For the first time, Audi is offering a two-tone interior including sporty contrasting stitching for S line models.